We are very excited to announce that the macchina of Alfa Romeo is our 2016 Proiettore Macchina!! ​Each year the Cortile selects a marque or model to highlight for the annual event based upon factors such as historical significance, unique local interest, brand resurgence, etc. Alfa Romeo has been selected as our 2017 Proiettore Macchina! ​Alfa Romeo was founded as A.L.F.A. "Anonima Lombarda Fabbrica Automobili" which stands for "Anonymous Lombard Automobile Factory" on June 24, 1910. 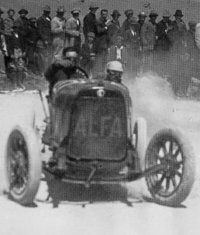 In August 1915, the company came under the direction of Neapolitan entrepreneur Nicola Romeo and in 1920, the name of the company was changed to Alfa Romeo. What is the Proiettore Macchina? Each year the Cortile selects a marque or model to highlight for the annual event based upon factors such as historical significance, unique local interest, brand resurgence, etc. and this is called our Proiettore Macchina. Alfa Romeo has competed successfully in Grand Prix motor racing, Formula One, sportscar racing, touring car racing, and rallies. It has competed both as a constructor and an engine supplier, via works entries (usually under the name Alfa Corse or Autodelta), and private entries. ​The company gained a good name in motorsport, which gave a sporty image to the whole marque. Enzo Ferrari founded the Scuderia Ferrari racing team in 1929 as an Alfa Romeo racing team, before becoming independent in 1939. It holds the world's title of the most wins of any marque in the world. "Alfa Romeo has one of the most ancient and historical emblem among all car brands in the world. This emblem was born on 1910, a few months after the Anonima Lombarda Fabbrica Automobili (ALFA) foundation, on June 24th 1910. On the left: the red cross on white field is the symbol of Milan, the hometown of Alfa Romeo. On the right: the symbol of one of the most important families in the history of Milan (and Italy), the Visconti family – the family that ruled Milan. There are a lot of legends about the origins of this heraldic symbol, representing a mythological animal with a human in his mouth (some believe it to be a dragon, but most likely a snake). ​During the time of the crusades, Otone Visconti , the founder of Visconti Family and a knight, fought against a noble Saracen knight (nomad from the Syrian Desert that bordered the Roman Empire). Otone beat the Saracen knight and, following the tradition, took the symbols the Saracen carried on his shield: a snake with a human in his mouth. At first glance, it looks like the snake is eating the human. Instead, the human is coming out of the snake a "new man," purified and renewed.